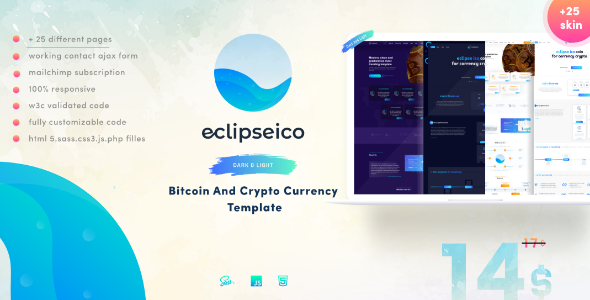 EclipseIco is a Clean and Modern Responsive Bitcoin And Crypto Currency HTML template. It is made using latest Bootstrap which gives it a unique custom design . It works nicely on all smart devices: smart phones, tablet, PCs and desktops. 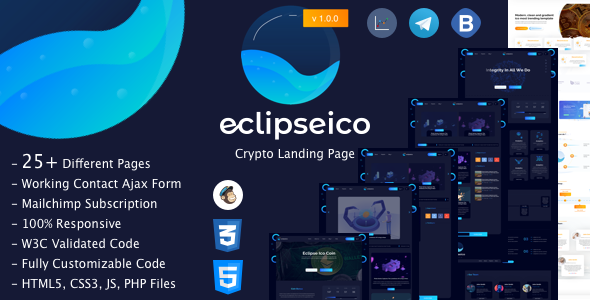 It includes 25 Pages to help you choose the right page for your website and reusable components, so that you can easily create new layouts with these components. Template includes built in Sass support , which help to change the styles easily. All files are clearly organised, as we believe it will be easy to use and edit them. Any one can customize this template as his wishes.